Hot Numbers is the one place that pretty much everyone had recommended to me in Cambridge. Now I’ve been there, I can see why. Café, single-origin roaster, music venue and, by association, art gallery, it’s got something for everyone. To start with, there’s some top-notch coffee, all single-origin, all roasted in-house at the Hot Numbers roastery. There’s enough here to satisfy any coffee geek, including a choice of two espresso beans (with milk and without) as well as decaf. Another single-origin is on offer as filter coffee through Aeropress, Clever Dripper and Syphon (although the Syphons were off being painted during my visit). There’s also a decent range of loose-leaf tea. If you’re not that obsessive about your coffee, it’s still a great place. To start with, the atmosphere is lovely and you can sit in the main room or in the adjoining art gallery. The cakes, with offerings from local bakers such as Afternoon Tease and Fitzbillies, are amazing, and there’s a decent breakfast and lunch menu, mostly centred around toast/sandwiches. The staff are excellent too: I was well looked after by manager Emma and her team: Shaun, Adrienne and Dom, who also roasts the coffee! 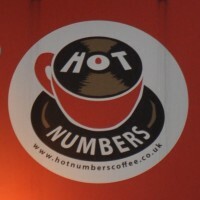 December 2016: I’ve updated my piece on the original Hot Numbers (now Hot Numbers, Gwydir Street to distinguish it from the roastery/cafe on Trumpington Street).This is the original write-up, published in September 2014. For an up-to-date description, please see the updated entry, while you can see what’s changed in my Coffee Spot Update. I was in Cambridge visiting my friend Richard, who was so traumatised by the experience that he’s emigrating to San Francisco next week! What is it with people meeting me then leaving the country? Anyway, the one condition of my visit was a trip to Hot Numbers, so on a rainy Saturday afternoon we trooped down Mill Road, turned left into Gwydir Street and reached Hot Numbers. Hot Numbers technically occupies the right-hand of two units in the old Dale’s Brewery building, the other half holding (since 2007) Williams Art. When Hot Numbers arrived in 2011, the two were distinct operations and they still are separate businesses, just with an archway knocked through the dividing wall so that you can take your coffee and sit in the gallery (technically, you can sit in the gallery and the staff will bring your coffee to you). Although very similar in size, the two spaces are quite different: Hot Numbers is a little busier, with a slightly lower ceiling, while Williams Art, with its slightly higher ceiling and the absence of a large counter at the back, feels brighter and more spacious. The seating is also different, Hot Numbers being dominated by four large four-person tables in the middle of the room. Two two-person tables with comfy chairs line the right-hand wall, while there’s a window bar and a small two-person table tucked in beside the counter. In contrast, the seating in Williams Art is much less uniform, with a large, square communal table by the window and a horseshoe arrangement of padded, backless benches around a large coffee table at the back. In between are a scattering of tables, some with comfy chairs, others with more conventional seats. For me, the coffee’s the main draw. Each single-origin bean is carefully matched to how you’re drinking it. For example, there are two single-origins for espresso, one if you’re drinking it without milk (espresso, Americano, etc) and one if you’re drinking it with (piccolo, flat white, etc). Then again, Hot Numbers don’t actually do “Americanos” or “flat whites”. Instead, you order by volume: 3oz, 6oz, 9oz or 12oz with either steamed milk or hot water. I’m assuming if order a flat white you’d get a 6oz with steamed milk (or more likely a short discussion about exactly what you want) but I never put this to the test. Richard had a 6oz with milk (Ethiopian Sidamo), while I selected the Brazilian Nossa Senhora as a straight espresso. I didn’t get the tasting notes of hazelnut and cinnamon with hints of liquorice, but then I never do. Nevertheless, it was a very fine espresso, strong, but neither bitter nor acidic, which came with a glass of water. I tried Richard’s 6oz with milk, not really appreciating its acidity and finding it slightly less to my taste. I followed this up with a decaf 6oz with milk which I drank without really paying too much attention, which tells me that it lacked the acidity that I disliked in the Sidamo! The staff were keen I tried it as an espresso, which was very good. Decaf is often overlooked, but this was excellent, a bright, full-bodied espresso with no hints of bitterness to it. I defy anyone, on taste alone, to know that it was a decaf.